The brightness of nature’s bounty, the kindness of friendly company, ease of total privacy, splendor of modern design, luxury of standard of living amenities and serenity of a peaceful atmosphere. Get all these together and you have DLF Samavana. A gently graceful, picture perfect community of Independent Villas, located on Kothar Road, Kasauli, Himachal Pradesh. Extensive living spaces and private lawns set amidst 58 acres of vast, pleasantly landscaped open areas, lush gardens and paved corridors. With the whole thing you want to live the life that you are familiar with at your control. The landscape of DLF Samavana Villas is dense and lush with a range of flora as well as shady trees, all serving to fresh the air and keeps it perfect. Meandering among these dense groves is an arrangement of pedestrian trails & walkways, with the overall landscape being dotted by water bodies. DLF Samavana also pampers its inhabitants with a fully accoutered clubhouse, which comes with each amenity that is required with a lifestyle of complete luxury. Aside from every up to date amenity and services that would be characteristic to an exclusive enclave such as the DLF Samavana, DLF Group are confident what you will be pleased about the most, is the fresh, pollution-free surrounding and serenity this beautiful piece of heaven presents. If you are thinking about buying a Villa in Himachal Pradesh, this is the only place you need to be at, a property that highlights the art of peaceful living. With an eye catching view of Shivalik Hills as far as the eye can see, these homes are a haven of tranquility when you’re tired after the rough and tumble of the day. Prearranged in the most beautiful manner possible, you come home in the lap of nature. See in your mind’s eye that you are sitting on your terrace, doing nothing but bathing your tired eyes in the golden rays of the dusk, the sky of wonderful pink, and in your mind, a superb nothingness. There is only one place that captures the spirit of Noida’s identity. Place that lie at the junction of time where a rich cultural heritage combines with modernity. It’s where one can strike an exclusive stability amid old world charm and a modern city lifestyle. This is a place called Lotus Yardscape Plots in Noida. This new plotted development is a much at serenity with a rich cultural heritage as with a modern way of life. And while this look likes an opposite ends of an argument, they come together completely here. Lotus Yardscape Sector 79 Noida is the perfect way to catch both faces of this location, which successfully means you have two of the scarcest real estate possessions in Noida, space and uniqueness. 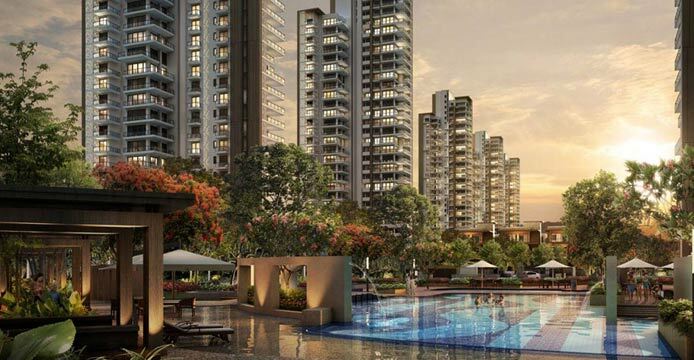 Located within easy distance of every facility, be it educational, commerce, transportation or amusement, Yardscape in Lotus Greens Sport City bring to every home seeker the advantages of an advantaged lifestyle. There’s no doubt that it will be the cynosure of all eyes like its looks the common as well as the individual amenities too will fascinate you. These plots available in 200 sq. yards – 500 sq. yards at very attractive price points. Lotus Yardscape Plots in Noida are like you blank paper where you can create your dream with your creativity. Away from the city humdrum and amidst space which breathes this residential community is to begin with a gated experience with amenities that are standard yet experiential-especially a huge common plot and club house. These independent plots providing that very canvas which is just right to make your dream house there today or when you tire of the city life. Services and facilities have been selected with a class consciousness to make provision for silky day to day operation. With the assistance of a reliable name of one of the top builders of the city, you can be confident of getting the property of your desires in Lotus Yardscape Plots.